To track the performance of your timers, you'll need to first open your dashboard. At the top of the dashboard sits a wondrous graph! Here, your timer views and clicks can be tracked. Each time someone visits a page on your store where a timer is displayed, a View is counted for that timer. And for any timer that has a link, any time someone clicks that button (or timer bar), it's counted as a Click (yeah, yeah, even if it's technically tapped on a mobile device). Just above and to the right of the graph are two dropdown menus. These two dropdowns affect what data is displayed in the graph and the three metric blocks below it. The one on the left allows you to filter your timers by name. You can view the data for all your timers at once or hone in on one timer at a time. Just click the arrow next to All Timers and select the timer whose performance you'd like to see. The dropdown on the left allows you to filter your timers by time (sounds confusing; it isn't). You can view the performance of your timers in the past week, two weeks, month, or the prior month. Just click the arrow next to This Week and select the range you'd like to view. 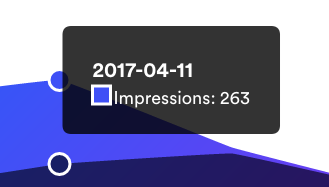 Hovering your mouse over the the graph—or tapping it, if you're on one of those newfangled mobile devices—will display a tooltip for the selected day's date, views, and clicks. 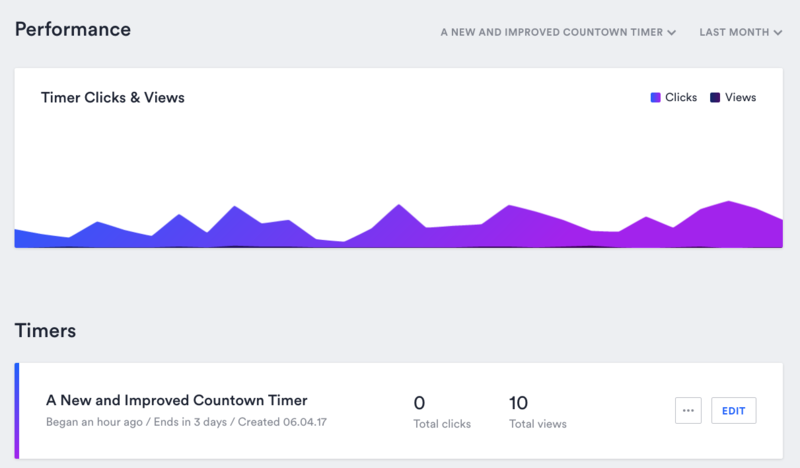 The metrics below show (adjacent to each timer name) represent the lifetime clicks and views ( Total clicks and Total views) for each timer. You can also see when your timer was created, when it began, and when it is scheduled to end here. Unpublished timers are not tracked—even if they were published previously and racked up millions of clicks and views. If you want to see your metrics, you're going to have to be bold and publish that thing.